In the land of Albian, magic is a quite normal thing. And every so often, the most powerful wizards, sorceresses, and magicians in all the land congregate for a meeting of the minds, the Convention of Magic Masters. This year the convention will take place at the beautiful Albian Castle, home of Gwendolyn the Fairy Godmother. But Gwendolyn is quite overwhelmed by all the work to be done before the convention and has called upon you to help. Search Albian Castle for treasures to help pay for all the necessary repairs and upgrades to be done. Along the way you´ll meet a crazy cast of wizards, witches, and warlocks. 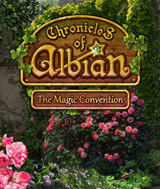 Solve more than 80 puzzles as you adventure through the beautiful castle of Albian, seek and find thousands of unique objects, and enjoy a breathtaking instrumental soundtrack. Choose between a myriad of medieval castle upgrades to create your very own new style. Will you finish in time for the convention? Comments: This is great fun. Good variety of HO screens, I played at leisure pace, would be challenging timed. Tons of objects to hunt for, cute concept. I especially enjoyed the mini-games between levels and the number of different games, including sudoku. It's also a rather long game, which is good. I played on a laptop, some items were small and hard to see but still was worth the time. Enjoy!